CUMBERLAND — Kathy Getty, Susquehanna Bank regional president, is this year’s recipient of the Henrietta Schwarzenbach Memorial Civic Service Award to be presented at the 64th Dapper Dan Awards Banquet on Jan. 29. The Dapper Dan dinner is set to begin at 4 p.m. at the Ali Ghan Shrine Club, with the awards program to start at 5 p.m.
Getty oversees Susquehanna’s commercial and retail banking activities in Allegany and Garrett counties and serves on many community organizations. 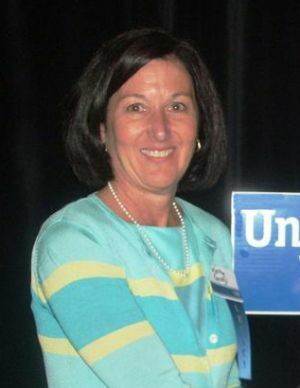 She is campaign chairwoman for County United Way, president of the YMCA Heritage Foundation, chair of the Cumberland Economic Development Commission, member of the Allegany County Board of Education Curriculum Committee and chair of The Greater Cumberland Committee. She also serves as treasurer of the Community Trust Foundation and the Maryland Leadership Workshop and is a member of the Western Maryland Health System and Greenway Avenue Stadium capital campaigns and Cumberland Rotary. Getty graduated from Georgetown University School of Business Administration with a bachelor’s degree and from Loyola College with a master’s in business administration. She lives in Cumberland with her husband, attorney Jeffrey S. Getty, and their three daughters, Elizabeth, Katie and Allie. This year’s Dapper Dan dinner speakers include Chicago White Sox pitching coach J.R. Perdew, George Mason University baseball coach Bill Brown and former Pittsburgh Pirates World Series hero Bob Robertson. For more information concerning the banquet, call The Original Sports Shoppe at 301-722-5490.